Can iZo's Iris synth innovate again? With its refocus on conventional synth-like behaviour, Iris 2 is an even more powerful instrument than its awesome predecessor. Music-friendly preset library. Slicker interface. Greatly improved modulation options. All library content included as standard WAV format sample library. Well integrated macro system. CPU hit can be hefty. With a slicker interface, improved effects, rejigged samples and preset library, and vastly extended modulation options, Iris 2 (AU/VST/AAX/RTAS/standalone) feels more like a synth in the conventional sense than the original Iris, which was decidedly esoteric in its presentation. It's been redesigned significantly enough that original Iris patches opened in Iris 2 won't always load up like for like, so upgraders are advised to keep the original installed as well. "Iris 2 feels and - more importantly - plays like a synth rather than a 'sound design application'"
Nonetheless, the central conceit remains the same. You still have four sample layers (although all of them can now load any type of sample, rather than three sample layers and a dedicated sub oscillator), which are edited in the Spectrogram window. Editing involves selecting the areas of a sample's spectrum that you want to hear, with the X-axis representing time, the Y-axis frequency, and brightness (the Z axis, if you will) representing amplitude, and the non-selected area filtered out. Selecting non contiguous areas is also possible, and non- horizontal lines along the X axis sound like filter frequency changes. Traditional sample looping is provided (forwards, backwards and one-shot), too, and you can still set each sample to one of three pitching modes: typical repitching playback (Resample), pitch shifting (Radius RT) and Fixed (ie, always at the same pitch, no matter which MIDI note is input). Between them, these fundamental tools can turn even the most mundane of samples into all manner of weird and wonderful sounds. Factor in the four-layer architecture, the Master Filter, and Master and Send Effects, and you already have an awesome sound design platform. Iris 2 turns the original Iris concept into a more useable and considerably more playable instrument. The transformative GUI upgrade enhances the foldaway panel workflow with some detachable sections (sample Mix Panel, Envelopes and Macros) and improved colour coding. The sample and preset library weighs in at 11GB (v1's was 4GB) and includes a folder of classic synth waveforms, including the Arp Odyssey, Roland JD-800, Polymoog and Prophet T8, amongst others. The Master Filter now includes 17 filter models, rather than ten, and in the effects section there's a new Digital Delay, as well as updated distortion models sourced from Trash 2. The modulation system has seen a complete rebuild, with five syncable LFOs and five ADSRs. Each of the 26 core LFO waveshapes (Triangle, Sine, Ramp, etc) is actually the first shape in a 'mini wavetable', enabling the LFOs to be modified using the modulatable Shape slider, which moves smoothly through the variants. Meanwhile, the ADSR stages can be curved by dragging them. Over 100 of Iris 2's controls can be modulated, with assignments made by dragging the modulator icon from a source to one of the three Modulation Range knobs next to the target parameter. So, each target can have three modulators, and each mod source can target as many parameters as you like, including other mod sources. The modulation depth is set using the aforementioned knobs, and you can also take control of how the three modulation sources interact. Ultimately, it all looks and feels rather like the equivalent system in NI's Massive, which is certainly no bad thing considering that synth's continued benchmark status. Two further patch-based modulation options are on hand in the shape of eight freely assignable Macro control knobs and four MIDI Expression Controllers. The latter comprise Key Tracking, Velocity, Aftertouch and Modulation, while the Macros are fully incorporated into the library Patches and even made accessible in the preset browser, for tweaking while patch surfing. Iris 2 is a very different proposition to Iris 1, mainly because it now feels and - more importantly - plays like a synth rather than a 'sound design application'. 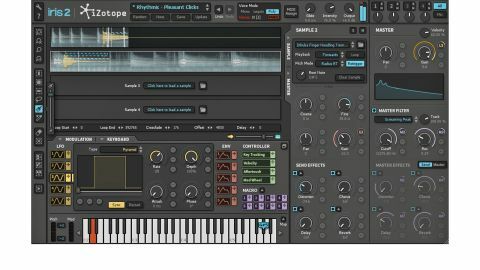 "Iris 2 is, without doubt, one of the finest virtual instruments ever made"
The classic synth samples contribute significantly to this, but the enhanced modulation and radically overhauled preset library can also claim much of the credit. Of course, the pads are stunning, and, perhaps predictably, the presets are dominated by the Keys/Leads/Pads categories. There's everything from spooky pianos ('Cave Epiano') and 60s flavours ('Lords of Canada'), to edgy leads ('Sine Shredder') and evolving textures ('Landing on the Moon'). However, it's the basses folder that really caught our ear, with punchy, contemporary sounds ('Booka Bass', 'Major Electro', 'Rabid') and subby tones ('Con Lazers' and 'Dark Sub') sitting alongside evolving noises ('Falling In Deep'). There are also some choice patches to be found in the Rhythmic folder ('Building', 'Chiba Seq' and 'Pleasant Clicks', to name but three). When you tire of the presets, importing samples of your own or from the factory library is an incredibly simple process. Finally, and usefully, patches can be exported complete with their source samples, making sharing and cross-session compatibility straightforward. Using the original Iris often made us wonder what would happen if the iZotope team were let loose on a more conventional synth, and in many ways, Iris 2 answers that question. The inclusion of the new classic oscillator bank and modulation options takes this plugin in new and exciting directions, building on its spectral foundations to deliver more 'music- friendly' sounds. It can be a little demanding on the host CPU, but when a synth sounds this good, that's to be expected. Iris 2 is, without doubt, one of the finest virtual instruments ever made.